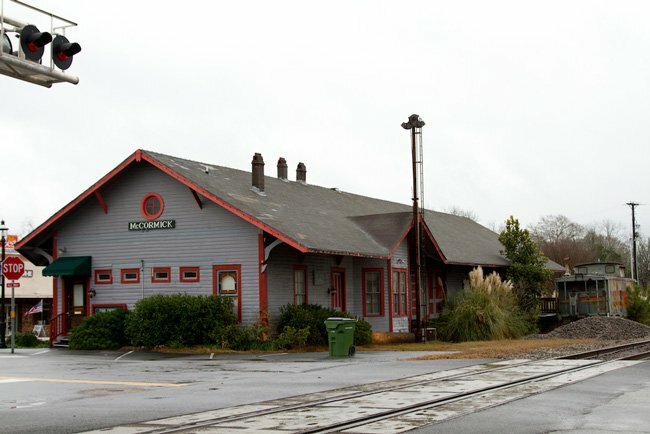 The McCormick Depot – located in the heart of McCormick, South Carolina – is a testament to the thriving railroad industry of the nineteenth century. The Greenwood and Augusta Railroad built the first station here in 1882, developed by town namesake Cyrus McCormick of Virginia. Though never a resident of the area, or even South Carolina, McCormick was an industrialist visionary who invested heavily in the town where a profitable gold mine was discovered in 1852. One of his primary investments was railroads. The railway became the Charleston and Western Carolina Railroad in the twentieth century, and that company built the second depot on this site in 1900. The third and current depot, built around 1911, now sits in the same spot. 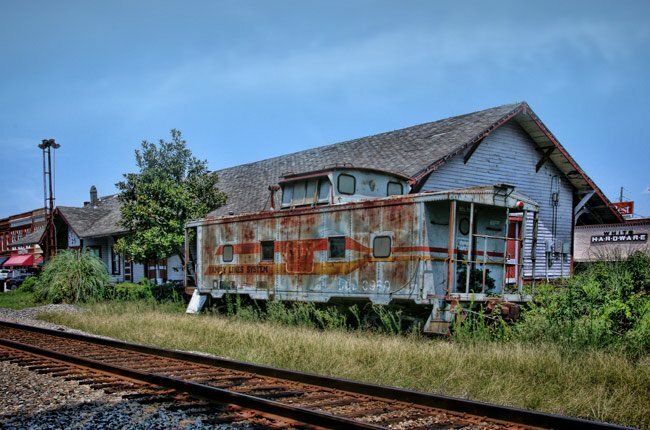 (Charleston & Western Carolina Railway Depot) The McCormick Train Station is a one-story frame building built ca. 1911. The building is a long rectangular building located between Main Street and the Seaboard Coast Line Railroad line. The building has a gable roof with wide eaves supported by brackets. The building has shiplap siding, original six-over-six sash windows, and the original frame and glass doors. On the west façade is a bay window which served as the ticket booth during the building’s operation. The station was built by the Charleston and Western Carolina Railroad. The present station appears to be the third constructed on this site. The first station was built by the Greenwood and Augusta Railroad in 1882 with the assistance of Cyrus McCormick. The first building was a frame building and stood until ca. 1900. A second station was then constructed by the Charleston and Western Carolina Railroad and stood until ca. 1910. The building is a good example of vernacular stations constructed in the state in the early 20th century and illustrates the significance of the railroad in McCormick’s development.